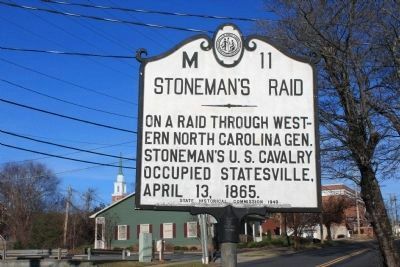 On a raid through western North Carolina Gen. Stoneman's U.S. Cavalry occupied Statesville, April 13, 1865. Location. 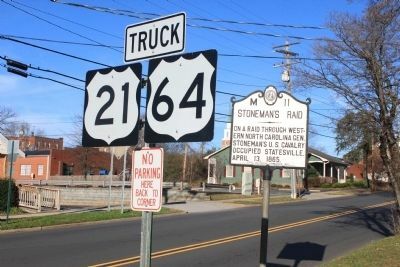 35° 47.04′ N, 80° 53.11′ W. Marker is in Statesville, North Carolina, in Iredell County. Marker is at the intersection of South Tradd Street (U.S. 21) and East Front Street, on the right when traveling north on South Tradd Street. Touch for map. Marker is in this post office area: Statesville NC 28677, United States of America. Touch for directions. (approx. ¼ mile away); Iredell County World War I Memorial (approx. ¼ mile away); Fourth Creek Meeting House (approx. 0.3 miles away). Touch for a list and map of all markers in Statesville. Credits. This page was last revised on June 16, 2016. This page originally submitted on December 29, 2011, by Jamie Cox of Melbourne, Florida. This page has been viewed 517 times since then and 7 times this year. Photos: 1, 2. submitted on December 29, 2011, by Jamie Cox of Melbourne, Florida. • Craig Swain was the editor who published this page.